Governor Andrew M. Cuomo today announced an additional $30 million in funding for the successful Urban Youth Jobs Program. Photo by: Don Pollard/Office of Governor Andrew M. Cuomo. 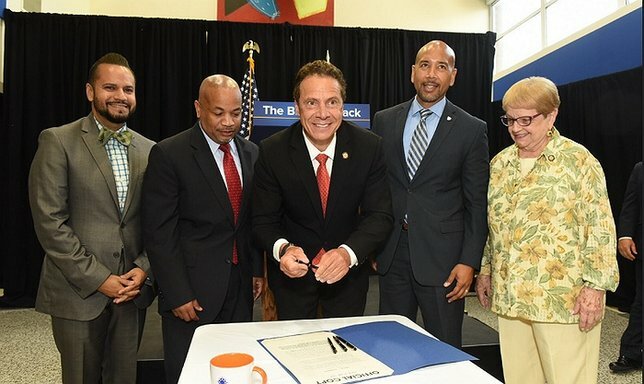 Albany, NY - July 13, 2016 - Governor Andrew M. Cuomo today announced an additional $30 million in funding for the successful Urban Youth Jobs Program, an innovative tax credit program which connects minority and at-risk youth with employment opportunities in communities across the state. The record investment brings total funding for the program to $50 million this year and builds on the Governor’s sweeping, multi-faceted efforts to remove barriers to unemployment in The Bronx and across New York. To accompany this initiative, the Governor announced the launch of a new website designed to connect young people with job opportunities and provide them with the skills they need to succeed as they pursue their future education and career goals. Governor Cuomo also announced the official launch of the nation’s first state-sponsored Pre-Apprenticeship Program, which he outlined in the 2016 State of the State Address. The state will today issue a Request for Proposals to training providers, who will prepare participants for a career in the building and construction trades. The program will match qualified trainees with permanent employment opportunities on major state infrastructure projects, including the new LaGuardia Airport and the complete overhaul of Penn Station. "In every corner of this state, we are taking aggressive action to restore economic opportunity and social progress by creating jobs, and The Bronx is at the forefront of this effort," Governor Cuomo said. "From the Unemployment Strikeforce to the Urban Youth Jobs program, we are making smart investments to tackle unemployment in communities where it is most pervasive, and connect tomorrow's workers with the skills they need to succeed in a 21st century workplace. Our efforts are demonstrating that government can be a vehicle for progress, and I thank Assembly Speaker Carl Heastie and Bronx Borough President Ruben Diaz Jr. for their partnership in building a better future for the Bronx community." Photo Credit: Don Pollard/Office of Governor Andrew M. Cuomo. The Governor’s sweeping efforts to remove barriers to employment in The Bronx have coincided with the borough’s 6.1 percent unemployment rate – its lowest for the month of May since 2001, and the lowest level in 15 years. The Governor has focused a variety of efforts to put chronically unemployed and disadvantaged youth to work through a series of innovative programs that connect young people with job and training opportunities. The announcement was made at Hostos Community College in The Bronx, where the Governor also highlighted the success of two existing programs: the first-of-its-kind Unemployment Strikeforce and the Summer Youth Employment Program. 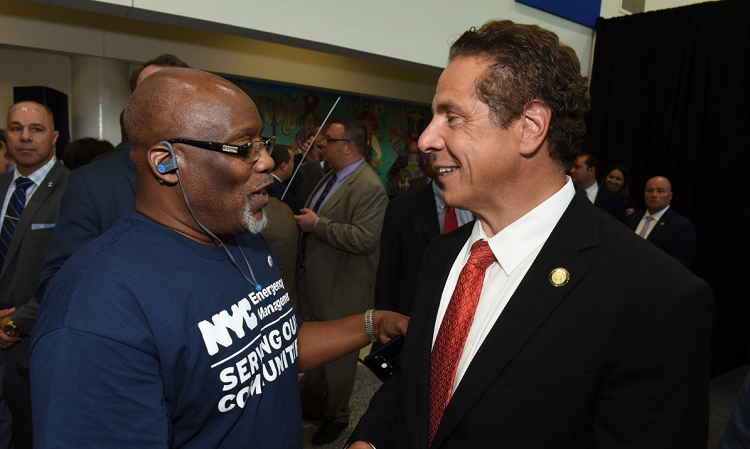 The Unemployment Strikeforce works to connect out of work New Yorkers with skills in demand by employers in cities across the state with the highest rates of unemployment. In just two years, the Strikeforce initiative has resulted in jobs for more than 23,000 previously unemployed individuals. The Summer Youth Employment Program in The Bronx, which allocates money to municipalities to work with non-profits to hire kids for summer jobs, has helped more than 12,000 youths in The Bronx obtain employment and this year received more than $70 million in state funding. Bronx Borough President Ruben Diaz Jr. said, “One of my first goals when I was elected Bronx Borough President was to reduce unemployment. Since becoming Borough President, unemployment has been cut by more than half, and our workforce participation rate is higher than ever before. We are helping thousands of teenagers and young adults find productive jobs that not only bolster their resumes as well as help expand and add skill-sets they will need down the road as they advance in their careers, while also keeping them off of the streets and out of trouble. I want to thank Gov. Cuomo and Strikeforce for helping us get there. We are always looking to continue to build on the positive results and the Strikeforce has proven to be a program that has helped us decrease unemployment in our borough to record lows, and these new programs for at-risk youth announced today by Gov. Cuomo will only help us continue that success." The new funding announced by the Governor expands the Urban Youth Jobs Program by allocating an additional $30 million for the initiative, bringing the program’s total funding for this year to $50 million. The program encourages businesses to hire unemployed, at-risk youth ages 16-24, who live in New York State, by providing a tax credit of up to $5,000 per employee. Since 2012, when first launched as a pilot program to provide youth from low-income families with job opportunities, the successful Urban Youth Jobs Program has helped 33,000 teens in 13 target areas that face high unemployment rates obtain jobs. Since the program’s inception, 8,000 young people in The Bronx have been hired. To incentivize employers to take part in the expanded program, New York State will conduct outreach across the state, in addition to the previously launched website to help businesses understand how the program works and take advantage of the opportunity. Employers can use the $5,000 tax credit for such activities as subsidizing wages, supporting education and training activities, as well as offering counseling and employment-related services, such as transportation to and from work. The Governor announced the official launch of the State Pre-Apprenticeship Program, first outlined in the 2016 State of the State Address. Disadvantaged youth have been underrepresented in apprenticeship programs and too often lack the skills or opportunities to benefit from the jobs available from state-funded projects. This program – the first of its kind in the nation – will reimburse employers who train the next generation of workers in the building and construction trades and help them obtain meaningful employment. The program will leverage major state-funded infrastructure projects, including the complete redevelopment of LaGuardia Airport and the new Penn Station, by placing graduates of the pre-apprenticeship program into state-registered apprenticeship programs affiliated with these projects. A $750,000 Request for Proposals has been released to non-profit training providers who will prepare disadvantaged youth for apprenticeship programs in trades such as building and construction. The program will recruit approximately 100 disadvantaged young adults between the ages of 18 and 24 who are out of school, unemployed, and interested in pursuing a career in building or construction. The program will offer reimbursement of up to $7,500 per successful trainee to qualified training providers. In order to be considered successful, trainees must graduate from the State Pre-Apprenticeship Training Program and then be placed into a Registered Apprenticeship Program. The Registered Apprenticeship Program must be affiliated with a contractor completing work on a New York State-funded project and the trainee must complete a portion of their on-the-job training hours on that project. Graduates of the State Pre-Apprenticeship Training Program will be prepared for permanent employment working on the transformational infrastructure projects happening across the state. Launched in The Bronx in 2014, the Governor’s successful Unemployment Strikeforce initiative was designed to target areas across the state suffering from high unemployment, with a focus on removing barriers to employment by connecting businesses to job seekers. In The Bronx, the program connects individuals to jobs and training in six high-demand sectors: Healthcare, Information Technology, Office and Administration, Transportation and Warehousing, Sales, and Hospitality. Of the 10,165 Bronx residents who have been served by the Strikeforce since its inception two years ago, 7,604 have been hired, 2,799 of whom were long-term unemployed. In May 2013, the year before the program was launched, the unemployment rate in The Bronx was 11.4 percent – the highest of any county in the state. In May 2016, the unemployment rate in The Bronx was at 6.1 percent, the lowest rate for the month of May since 2001. Because of its success in The Bronx, the Strikeforce was expanded to include the 10 counties in the state with the highest rates of unemployment. Since its creation in 2014, 23,835 unemployed individuals across the state have been hired through the program. Governor Cuomo has awarded more than $31 million statewide for the 2016 Summer Youth Employment Program to provide summer jobs for youth ages 14 to 20 who reside in lower-income households. For six to eight weeks of the summer, the teens and young adults work in entry-level jobs at places such as parks, nursing homes, summer camps, child care organizations, senior centers, and community recreation centers, among others. Approximately $16 million in funding will enable nearly 11,000 young people in New York City to be employed this summer through the program, including an estimated 2,500 youth in The Bronx, who will gain valuable work experience and improved chances of future employment. The Summer Youth Employment Program in The Bronx, which allocates money to municipalities to work with non-profits to hire kids for summer jobs, has helped more than 12,000 youths in The Bronx obtain employment since 2011. Senator José Serrano said, "The Urban Youth Jobs Program is a common sense solution that benefits all stakeholders, with both community members and businesses owners reaping the rewards. By providing incentives to business to hire disadvantaged Bronx youth, this program equips future workers with the skills and experience they need to succeed. Thanks to Governor Cuomo, the next generation of workers are growing stronger, and the economic future of The Bronx is brighter than ever beforeý." Assemblyman Marcos Crespo said, "As Bronx County continues to experience a tremendous renaissance, it is clear that the vision, leadership, partnership and investments led by Governor Cuomo have been instrumental in achieving the positive results we've seen. Hundreds of millions in residential and commercial development, investing in the growth of the Hunts Point Markets, expanded Metro North and other transportation options, and a historic drop in unemployment rates throughout the borough are just some of the initiatives Governor Cuomo has led in order to improve the lives of all Bronx residents." Marlene Cintron, President of the Bronx Overall Economic Development Corporation, said, "There is no issue more important than ensuring that our youth have the resources they need to lead fulfilling and productive lives. Our hope for tomorrow rests in the hands of the next generation, and here in The Bronx, Governor Cuomo has made clear that he is committed to our promising men and women. For years, rising unemployment has been at the core of this community's stagnation, but through key initiatives like the Urban Youth Jobs Program, the Governor has made certain that the story does not stop here for The Bronx. We are proud of this initiative in all that it aims to achieve and the tangible results it is delivering for our young people." Subject: LongIsland.com - Your Name sent you Article details of "Governor Cuomo Announces $30 Million to Expand Urban Youth Jobs Program and Launches Statewide Pre-Apprenticeship Job Program For Construction Trades"